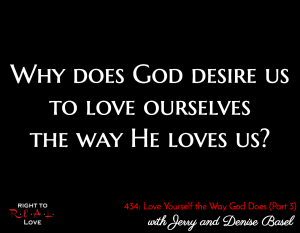 In this episode, Jay continues his discussion with authors Jerry and Denise Basel by addressing the question: Why does God desire us to love ourselves the way He loves us? How does the way we typically love ourselves differ from the way God desires for us to love ourselves? Why does God desire us to love ourselves the way He loves us? The benefit of operating in the fruit of the Spirit. The danger of putting trust in ourselves instead of in God. Why God desires for us to love ourselves.